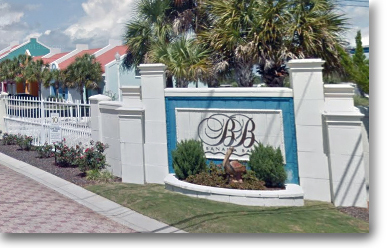 The Banana Bay community is a hidden gem of colorful unique town homes and bungalows set along Perdido Key's Intracoastal Waterway. Ultimate relaxation and leisure is the way of life in this family-friendly neighborhood. Homes at Banana Bay vary in size from 2 bedrooms to 4+ bedrooms with an average list price of $350,000. Built from ICF construction, these residences are able to withstand wind speeds of 200 mph. Amenities at Banana Bay include a heated outdoor pool, hot tub, private boat slips, exercise facility, and meeting rooms. A large sandy beach stretches along the waterfront providing the perfect spot to launch your kayak or paddle board. At the end of the day, enjoy a glass of wine and savor the beautiful sunsets over Perdido Key. Banana Bay is a great place for your weekend beach getaways offering a relaxing and pleasant atmosphere for your family and friends. If you are looking for a bite to eat, several popular restaurants are nearby including Fisherman's Corner and Sunset Grille. Banana Bay sits to the right of River Colony condominium and directly across from Lost Key, an exclusive golf resort community surrounded by Perdido Key's natural beauty. Discover more residences in the surrounding area by visiting our Perdido Key Homes for Sale and Perdido Key Condos for Sale pages. Please let us know if you would like further info for Banana Bay, other Perdido Key homes, or real estate along the Gulf Coast or would like to schedule a private viewing by emailing info@condoinvestment.com or by calling (251) Area-Pro (251-273-2776) for immediate assistance.